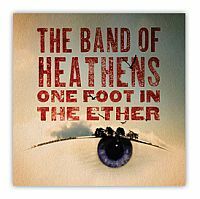 I was first introduced to The Band Of Heathens via their appearance on Austin City Limits last year and I ended up being really impressed. This three-headed music monster consists of a trio of front men, Colin Brooks, Ed Jurdi and Gordy Quist, who can all sing, write and play a wide variety of instruments. While each one has enough talent to pursue a solo career, they decided to join together and have combined their abilities into a multifaceted music group filled with compelling songwriting, genre blurring musicianship and loads of Texas charm. A piece of their identity can also be found in the inability to nail down exactly what label they fall under. Are they rock, country, blues, soul, alt-country, Americana, or something altogether different? After immediately getting lost in the first few songs, you’ll find out the answer is all of the above and then some. One Foot In The Ether kicks off with “L.A. County Blues,” a song that showcases many of The Band Of Heathens’ strengths. The beautiful vocal harmonies, laid back groove, old country guitar lines, and lyrical winks to both Hunter S. Thompson and John Prine are a great introduction to what this band encompasses. Songs like “What’s This World” and “Let Your Heart Not Be Troubled” follow in the same twangy vein as well. Is southern rock a little more your thing? “Talking Out Loud” and “Look At Miss Ohio” are two of the best Black Crowes song that they never wrote themselves. You like Memphis-based soul numbers? Well, the playfulness of “Shine A Light” and “You’re Gonna Miss Me” should be right up your alley. You want to hear some bluesy shuffles? They do that too on “Say” and “Somebody Tell The Truth.” The Band Of Heathens musical mixture isn’t just for show. Their blend of backgrounds and preferences flow together naturally and really support and enhance the great songs they have written. Each instrument and tone fits into the structure and vibe of the song and there’s not one moment in the variety of it all that sounds out of place or out of context. My personal favorite off the album is the Tom Waits sounding “Golden Calf.” Slightly distorted bluesy vocals, tremolo guitar chords, surreal lyrical images, junkyard percussion sounds and a hypnotic rhythm make this song sound like an outtake from Tom’s Mule Variations album, which scores The Band Of Heathens super big points with me. With everything they have to offer, the common thread throughout the album is the song writing. Since the band was formed when all three of the guys ended up sitting in on each other’s solo sets at a local Austin club, they've developed a unique ability to add their own voice and touches to each other’s songs. This has made the songs richer and stronger than they were in solo form. This strengthening is evident all over One Foot In The Ether. If two heads are better than one, then you know three heathens have got to be good!